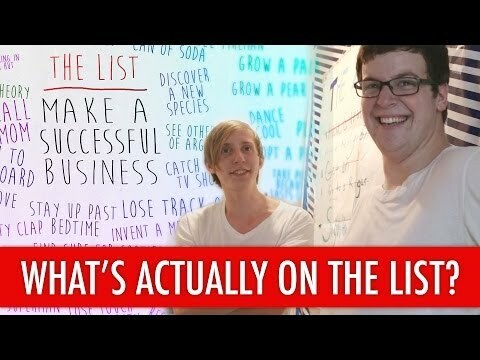 New Video: What’s Actually On John and Kyle’s List? What happens when you spend days covering a house with gift wrap and a giant to-do list of everything there is to do in the world? You feel compelled to make a video to show JUST how damn hard you worked! While on-set filming the John and Kyle Do Everything movie, we took a brief pause to review the hundreds of list items on the walls throughout John and Kyle’s house. To give you some perspective, we had PAGES of list items as we started the set decoration, and somehow that STILL wasn’t enough. We had to make up even more on the spot. The list is the most important element to the John and Kyle series— it provides the “Do Everything” in the name, after all. It seemed obvious to give it its own video! Some of these list items were just too funny not to tell you about anyways. We have two more videos coming your way too! Look forward to our extensive Deleted Scenes and Bloopers videos!